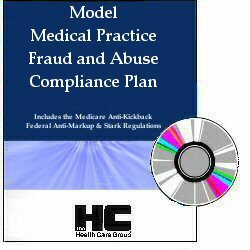 This Model Medical Practice Fraud and Abuse Compliance Plan guides you through the key laws applicable to medical practices, and helps you develop your own up-to-date, effective Compliance Plan. This manual includes an explanation of the key federal laws that apply to all medical practices, including Medicare/Medicaid Anti-Kickback Law ("AKS"), the Stark Law, and Federal Anti-Markup Law ("AMR"), and helps you understand how to keep within the boundaries of these laws. This Manual is in four parts: Part One provides an overview of what the Practice needs to know about the laws and regulations, and the penalties for different kinds of errors. Part Two is a Model Compliance Plan for the Practice to use as a template that can be customized to fit the Practice. Part Three contains a number of Exhibits that the Practice is likely to need to implement its compliance requirements, including key AKS safe-harbor regulations, Stark and AMR regulations, and flow charts to help you apply the Medicare safe-harbors and Stark Laws to your practice. It also contains guidance on responding to fraud investigations, a Code of Ethics, additional web-based resources, and more. Part Four has Compliance Training materials to help fulfill training requirements, both for managers and staff. These include an extensive PowerPoint presentation with regulatory review and an interactive quiz to test knowledge.